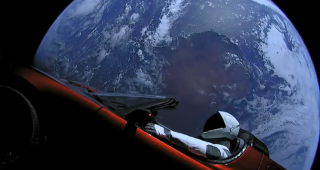 SpaceX's Starman mannequin is seen inside Elon Musk's red Tesla Roadster with Earth in the background, shortly after it launched atop a Falcon Heavy rocket on Feb. 6, 2018. When SpaceX launches its first Crew Dragon capsule on an uncrewed test mission to the International Space Station (ISS) this Saturday (March 2), the vehicle will be carrying a passenger of sorts: a humanoid dummy wearing the company's sleek black-and-white spacesuit. Such a suit also graces the inert body of Starman, the mannequin driver of the red Tesla Roadster that SpaceX launched into orbit around the sun last year on the maiden flight of the company's Falcon Heavy rocket. "There is a — can I say dummy?" Hans Koenigsmann, vice president of Build and Flight Reliability at SpaceX, told reporters Friday (Feb. 22). "Is that the right word?" Actually, the technical term is a bit fancier than that. "ATD," NASA Commercial Crew Program manager Kathy Lueders told Koenigsmann during the news conference, apparently referring to an anthropomorphic test dummy. "We prefer to not call them dummies." "There is a puppet? Dummy? ATD — whatever it is — in there," Koenigsmann replied. "And we'll measure the responses on the human body, obviously, and measure the environment. We want to make sure that everything is perfect for, you know, the safety of the astronauts." So, the sensor-laden ATD will be a bit more high-tech than Starman, who was not required to measure any loads or stresses during his epic liftoff. And we'll just have to call it "the ATD" — until SpaceX brass tells us otherwise. "Actually, I forgot to ask the name," Koenigsmann said. "I know he or she has a name." Crew Dragon is based heavily on the robotic Dragon capsule that has been making resupply runs to the ISS for NASA since 2012. But the crew variant has seven seats, a life-support system, an emergency-escape system, touch-screen displays, windows and other important passenger-related accoutrements. There are other important differences, too. For example, the robotic Dragon has traditional deployable solar arrays and is grappled by the ISS' huge robotic arm. But Crew Dragon's solar panels are built into its trunk, and the capsule will dock directly to the orbiting lab. The upcoming uncrewed flight, called Demo-1, will put Crew Dragon and its many systems through their paces during a six-day mission. If all goes according to plan, Crew Dragon will depart the ISS on March 8 and make a parachute-aided splashdown in the Atlantic Ocean. The same capsule will also fly a "high-altitude abort test" in the coming months, proving out the emergency-escape system. Demo-2, during which a Crew Dragon will carry two NASA astronauts to the ISS, is scheduled to lift off in July. Operational, contracted flights for the space agency will start after that. SpaceX isn't the only company that holds a NASA commercial-crew contract. Boeing is developing its own astronaut taxi, called the CST-100 Starliner. Starliner is scheduled to make its first uncrewed demonstration flight to the ISS no earlier than April. Space.com managing editor Tariq Malik contributed to this story. Mike Wall's book about the search for alien life, "Out There" (Grand Central Publishing, 2018; illustrated by Karl Tate) is out now. Follow him on Twitter @michaeldwall. Follow us on Twitter @Spacedotcom or Facebook.